As some of you may know, when not parading as a Sleeps5 travel blogger extraordinaire, I keep the lights on by teaching the three R’s to children ages 5-14. In my experience as a mom and a teacher, travel for kids can be like one long field trip minus 25 other fifth graders. We know as parents and teachers there are inherent benefits our kids experience through travel. Recently, I came across a survey “The Impact of Early Travel Experiences”, conducted by Student Youth & Travel Association and Explorica, discussed in USA Today which gave more concrete evidence. The survey showed that regardless of students’ demographics, race, or gender, they experienced the following benefits from travel: higher graduations rates, higher grade point averages, and higher future income, among other benefits. 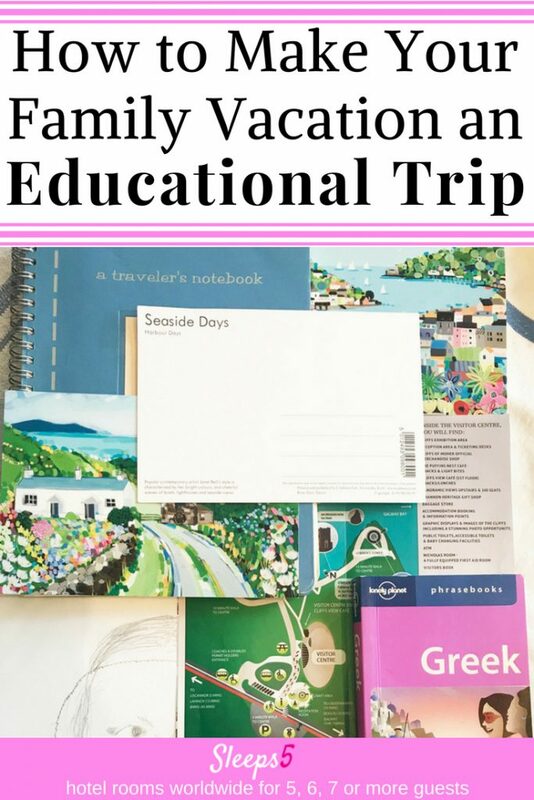 With this in mind, I have listed below a number of enrichment strategies I have used for school field trips and for families traveling in the middle of the school year. Full disclaimer: if these seem too much, do not add them to any parental guilt bucket. Sometimes it is enough to make it out the door with adequate suntan lotion, much less a differentiated, academic, learning target for each family member! Your kids may balk. Certainly, my own long-suffering children have been the guinea pigs to much of my educational enthusiasm (I once made an entire board game for the city of Florence). Still, even moderate efforts can really deepen the learning experience and understanding for kids while traveling in unfamiliar places. Here are a few tried and true ideas. This blog post contains affiliate links – at no extra cost to you, using Amazon through a link may result in a small commission to Sleeps5. Watch movies filmed on location, for example: Lizzie McGuire – Rome, Mary Poppins – London, Legacy of the Rubies – Nigeria, Abeba & Abebe – Ethiopia, The Wayang Kid – S.E. Asia, Night in the Museum – NYC etc. Point out important architecture and cultural norms while watching. Trace your journey starting at home on a map or globe, noting large geographic features like oceans, mountains, lakes, deserts and so on. If a new language is a factor, learn, as a family, a few polite phrases and greetings. Merci! If possible, take them to a restaurant that specializes in the cuisine where you will be heading, or find a few recipes online to try at home. 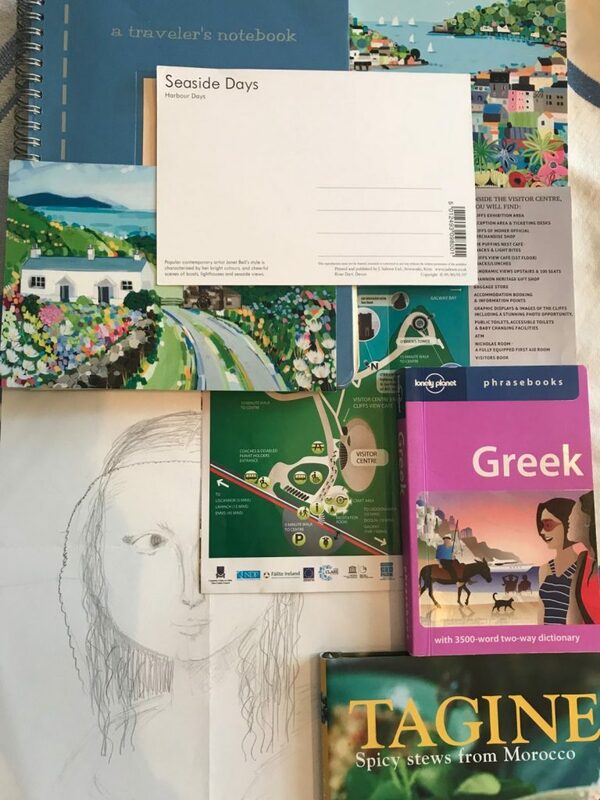 If you are visiting art museums, find a few examples of things that will be important to see online or in art books. Have them sketch the Mona Lisa, for example, before they go. Find out from teachers if there is anything in your travels that coincides with what they are studying in school. For example: We made our way to an Etruscan museum in Volterra, Italy based on future classroom study. And, we traveled to historic Revolutionary War landmarks before our kids took US History. Add educational materials to your packing list. Ideas to bring with you: pens and pencils, lightweight journals, postcards, glue stick. A) Buy some local postcards, otherwise use ones you brought. Have students write a short description of their experiences. If it is convenient, mail the cards home, otherwise slip them into the suitcase. Students who are intimidated by writing will be relieved to see a postcard’s limited allotted space. These postcards can be used as a framework for classroom essays when they get home, as well as serve as reminders of their trip. If they have writer’s block, ask them to name something from the fives senses: what did you smell, hear, taste, touch, see? Or how is this place similar/different than my home? B) Write or draw once a day in a journal and glue in mementos, pressed flowers, etc. C) Prepare kids for what they are going to see or do for the day. If you are heading to an art museum, for example, give kids a little background description of important works and let kids choose some things they want to see. When looking at artwork (of a person), ask children how are the subject is dressed, what are they doing, what are they feeling, what does this tell us about this person, what does the artist want us to know? Do not try to see everything — take a break for lunch! D) Let kids make small purchases using unfamiliar money. E) Show students the tourist maps and identify where you plan to go for the day. Let them navigate or show them how you will get there. Explain the map key, and distances, if possible. F) Review. Debriefing at the end of the day can bring kids full circle in their learning. Ask them for highs and lows, things that were unexpected, and or compare and contrast questions. This gets to be harder with teens and their phones but the dinner table still allows time to touch base and relive the day. A) Run a series of your photographs on the computer or TV for a family viewing night. B) Watch movies that took place in your given location, even repeat ones you watched before you left. The viewing will feel different now. C) Collect those postcards as they arrive if they were mailed, or retrieve those that were saved in a suitcase while traveling. Read them and then keep them for writing or as study inspiration in school. D) Have kids read back over their journals. These entries will prompt their memories. E) Try a new recipe based on something someone enjoyed eating while they were there. The above list is by no means meant to be exhaustive. Hope it has inspired you. We at Sleeps5 would love to add any suggestions to this list that have been beneficial for your family. 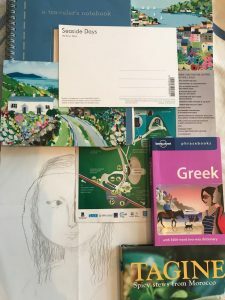 To see Amazon’s reviews and prices, click here for fun travel journals for kids , and also click here for gorgeous, quality travel journals for older kids or for yourself! Now plan your next trip!